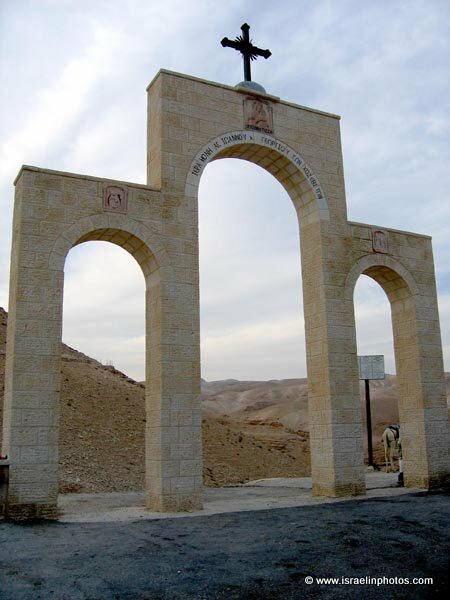 A free-standing arch marks the beginning of the path down to the monastery and the monastery’s observation point offers wonderful desert panoramas. 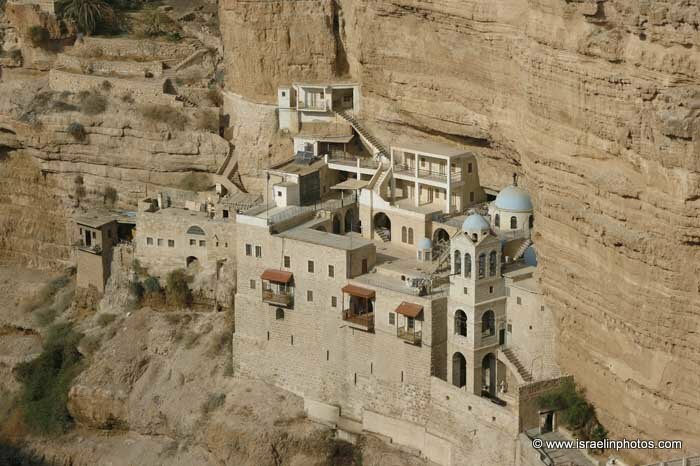 The monastery of St. George is of a Lavra or Laura originally meant a cluster of cells or caves for hermits, with a church and sometimes a refectory at the center. The term originates from Greek where it means 'a passage' or "an alley". 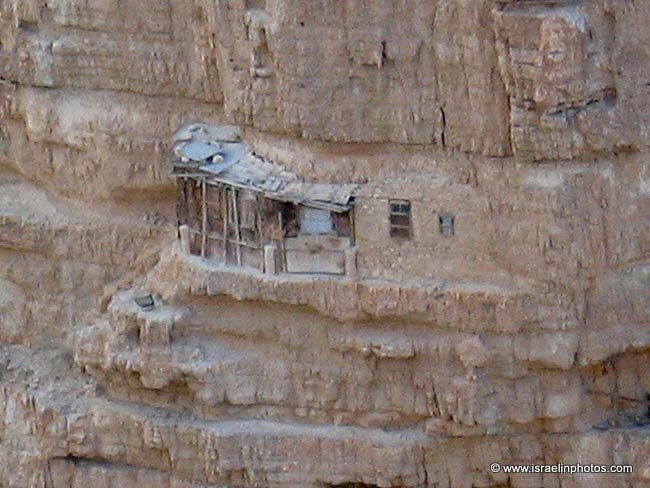 A hermit [from the Greek eremos,, signifying 'desert', 'uninhabited', hence 'desert-dweller'] is a person who lives to some greater or lesser degree in seclusion from society. 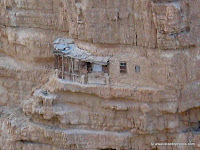 Christian monks began to settle in the Judean Desert in early 4th century A.D. as a respite from the secular world. 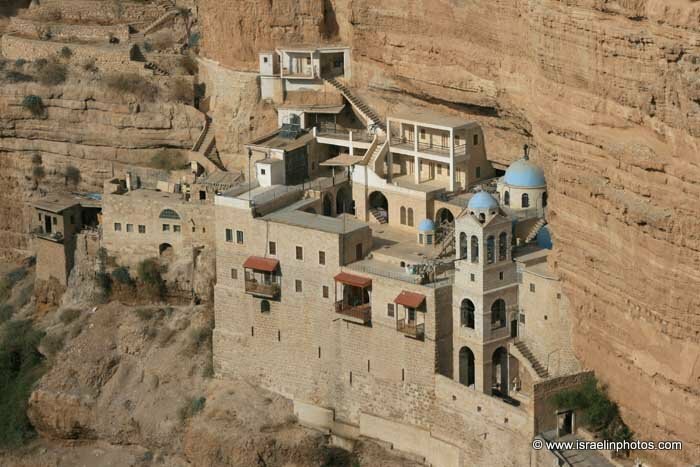 Between the fifth and the seventh centuries, the Judean Desert showed an extraordinary concentration of monastic foundations, with more than seventy monasteries dispersed in its plains and rocky slopes. 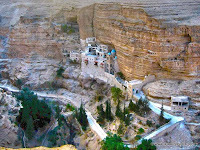 The first monks to settle as hermits in the caves in this part of Wadi Kelt were named Prono, Elias, Gannaios, Ainan and Zenon (about 420 CE). A small oratory built by five hermits was transformed into a monastery by St. John of Thebes about 480 CE. In the 6th century CE it became known as St. George under the leadership of Gorgias of Coziba, born in Cypus about 550 CE. The Persians destroyed it in 614. A Greek-Arabic inscription above the old entrance of the monastery testifies to its reconstruction in 1179 by the emperor Manuel I Comnenus (1143-1180). In 1483 Felix Fabri saw only ruins. 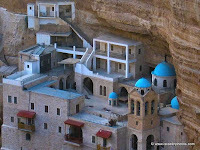 In 1878 a Greek monk, Kalinikos, settled here and restored the monastery and it was completed in 1901. The oldest part of the building is the 6th century CE mosaic floor of the Church of St. John and George. 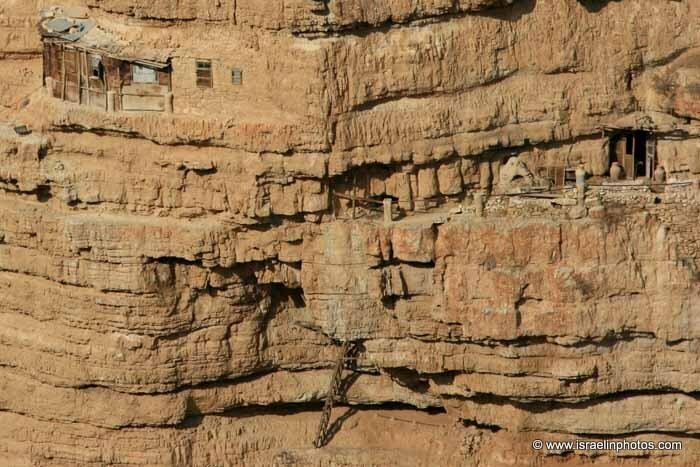 The skulls of the monks martyred by the Persians are kept here and a niche contains the tomb of St. George. 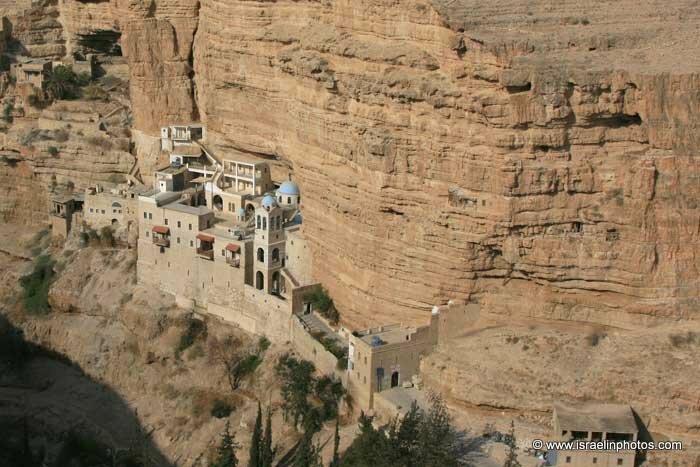 Legend has it that Elijah stayed here for three years and six months on his way to the Sinai and was fed by ravens: "he went and stayed in the ravine of Kerith east of the Jordan, and the ravens brought him bread and meat…" (I Kings 17:2-10). This tradition has supplanted a medieval one according to which Joachim, father of the Virgin Mary, hid here for forty days bewailing the barrenness of his wife Anne, whereupon an angel announced to him the conception of a daughter who would become the mother of the Messiah. 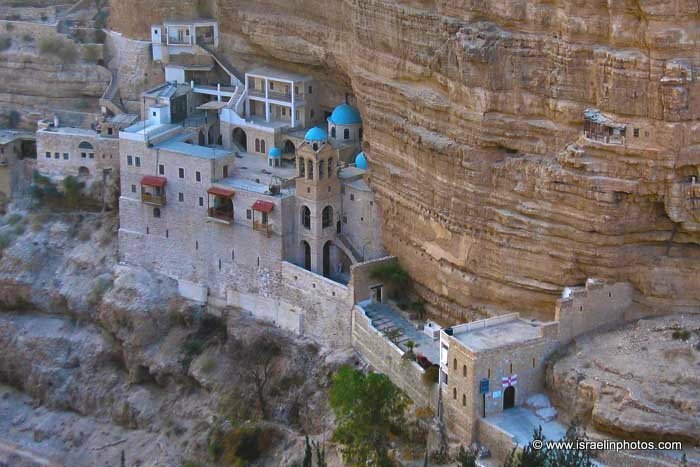 Carved out of rock face, the magnificent Greek Orthodox monastery lies deep in a desert canyon, surrounded by a lush garden of trees. 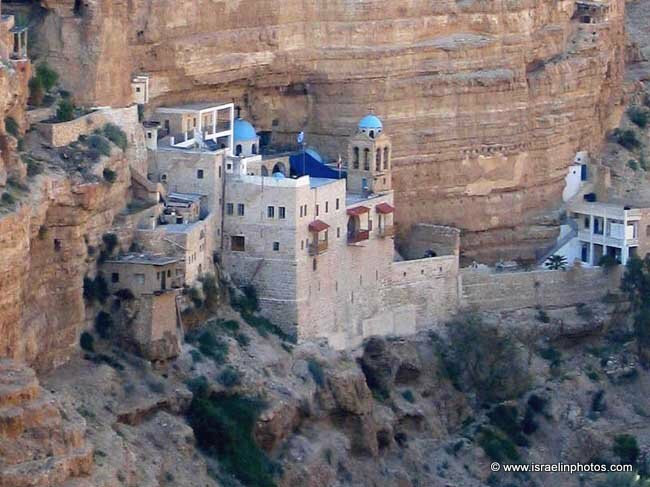 This is one of the oldest monasteries in the country and is located where the prophet Elijah is said to have stayed on his way to Sinai. It was here that St. Joachim was informed by an angel of Mary’s conception. 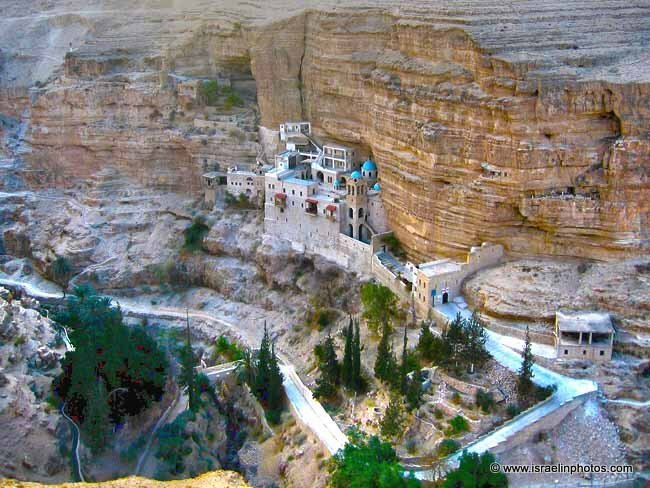 In the Monastery there is still today a monastic Brotherhood under the spiritual guidance of the Greek Orthodox Patriarchate of Jerusalem.